Paul-Henri Marron came from a Huguenot family which had sought refuge in the Low Countries. He was the first pastor of the Reformed Church in Paris. 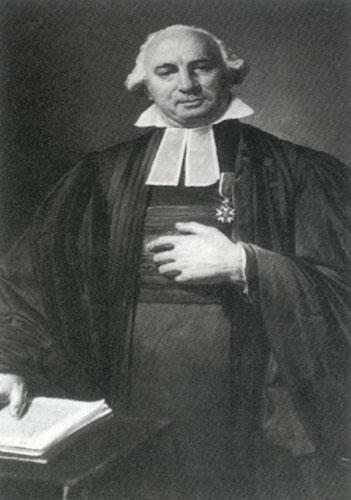 Paul Henry Marron, first pastor of the Église Reformée in Paris © S.H.P.F. Paul-Henri Marron was born in Leyden – his family, who were Huguenots, originally came from Saint-Paul-Trois-Châteaux (Drôme). He studied theology in Leyden, going on to become a pastor in Dordrecht (1776). In 1782, he was appointed chaplain to the Dutch community in Paris. Rabaut Saint Etienne had Paul-Henri Marron officially appointed as pastor to the protestant community in Paris. In the edict of Tolerance (1787), Louis XVI gave back to the Protestants their civil status, which had previously been taken away from them. It was possible to celebrate religious service in private for non-Catholics, but not in public until 1789. However, the Protestants in Paris decided to take no notice of this and on 7th June 1789, a Protestant service was held in rue Mandetour in a room at the back of a wine shop, normally reserved for wedding banquets. Then in February or March 1790 another Protestant service was held in the house at 105, Rue Dauphine. This is where Antoine Court de Gébelin’s “association of scholars” called the “Musée de Paris” had met regularly in the past. In 1791 the “Directoire” gave permission to the Town Hall to rent out the Saint-Louis du Louvre church, (which was not in use at the time) to “a group of people claiming to be Protestants”, and on Sunday 22nd May 1791 the first public celebration of the protestant service took place. A consular decree on 2nd December 1802 declared that the Saint- Louis du Louvre church should be set apart for the Protestant community. But in 1806, Napoleon decided to have the church demolished because he wanted the Louvre to form part of the Tuileries. He placed the Oratoire du Louvre at the disposal of the Reformed Church. First built in 1621, according to plans by the architect Jacques Lemercier, this building was used to store the scenery of the Comédie Française during the French Revolution. The new church was inaugurated and the first official service held on 31st March 1811. Marron was the pastor of Saint -Louis du Louvre then of the Oratoire du Louvre until his death in 1832. Marron was sometimes considered as an opportunist because he appeared to pander to each government in power from Louis XVIth onwards – indeed he sent tributes, in verse or in prose to their leaders. But one must consider the fact that his position as a pastor at that time was certainly a difficult one. He was arrested twice and imprisoned in June 1794 for having continued to celebrate weddings and baptisms in secret.